The SMG Garden Committee thanks the many people who helped care for the plants and improve the Garden in the last year. 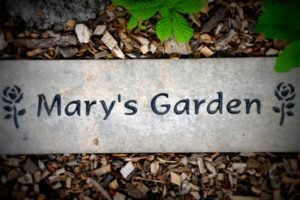 We had fun planting and teaching about seeds with the younger St. Mary of Gostyn students in the spring and had lots of help over the summer to keep those seeds and plants alive. We loved seeing the stones from the Vacation Bible School children surrounding the statue of St. Francis and were happy to share some of the bounty of the garden with the St. Vincent DePaul Food Pantry. 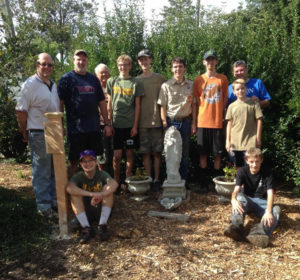 The major summer project was an Eagle Scout Project featuring the installation of educational plaques by Dan Albert, his family and the Boy Scouts of Troop 89. They provide information and context for the space and truly make it “educational”. Nicole Gibson and friends hosted a successful movie night in September and once again, Cub Scout Troop 89 cleaned up the garden for the its winter sleep. 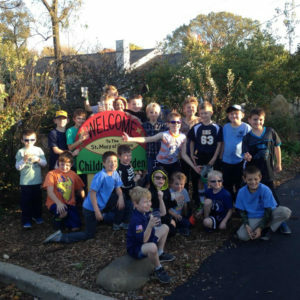 SMG Daisy Scouts visited the garden this fall to learn and plant sedum donated by a generous parish family. We thank the many families and groups that contribute time and talent each year and look forward to 2017. If you have a question or would like to help in the Garden, contact Nicole Gibson at [email protected] or Hilary Denk at [email protected], or contact the Rectory. Keep an eye out for a brick order announcement in the spring.